Home » Frequently asked questions » Earliest records - FAQs » Where is the earliest known Thrale grave? Where is the earliest known Thrale grave? Robert Thrale who died in 1538 in Sandridgebury, Hertfordshire, was according to his will, buried in the "the medle Aley" of St. Leonards Church, Sandridge. 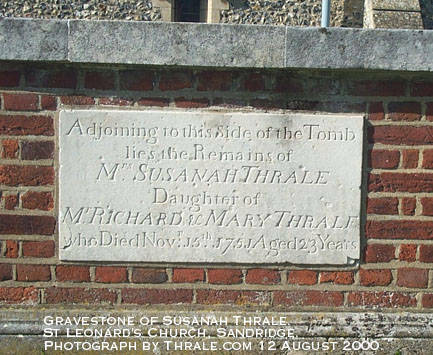 The earliest known grave of which any trace remains is in the graveyard outside St. Leonard's Church in Sandridge village lies is the tomb of Susanah Thrale who died on 15th November 1751 Aged 23. 1. Source: Historic Sandridge Revisited. Edited by Janet R Rose. 1999. ISBN 0-9537647-0-2. St. Leonard's Publishing Sandridge. Where do the Thrale family originate from? Who is the earliest recorded Thrale? How far back can the Thrale family tree be traced? Who was the first Thrale to emigrate to America?